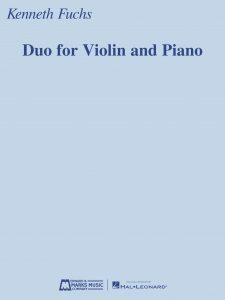 “Duo for Violin and Piano” is cast in the form of a single, continuously evolving movement, whose musical ideas move from an urgent, hushed blur of whirring sound to a buoyant and optimistic lyrical theme, stated by the violin over syncopated chordal ﬁgures in the piano. The melodic shapes of these episodes are transformed in various moods and tempi throughout the composition. Premiered and recorded by Julie Rosenfeld.